Filipino cuisine is highly sought after by many tourists. In this guest post, discover six top Filipino foods to try when you visit the Philippines. This is a guest post by Ruben Arribas at Gamintraveler, a collection of travel guides, techniques and inspiration on how to achieve an on-the-move lifestyle. Filipino food is a mixture of many cultures from all around the Philippines. And most of the dishes, even the really popular ones, have their own version from different places around the country. And with more than 7,000 islands in the Philippines, each of these have their own special Filipino food. This might be a recipe passed down by many generations or a newly crafted one. This variety means all the more reason to visit places all over the Philippines. The Philippines had been under Spanish occupation for over 300 years. So it is not surprising that a lot of Filipino dishes have influences from Spanish cuisine. Other dishes are derived from the Chinese as well, due to the Philippines having shared history with China. Foodies from all over the world will definitely want to try out and taste these amazing dishes while traveling all over the Philippines. So continue reading for some of the must-try special dishes from all over the Philippines! Batchoy is a noodle soup which contains pork offal, crushed pork cracklings, chicken stock, beef loin and round noodles. Its origins are from the district of La Paz, Iloilo City in the Philippines, hence it is often referred to as La Paz Batchoy. When you search or ask friends on where to find the best batchoy in Iloilo, all of them will point you to La Paz market. That’s why the term ‘La Paz Batchoy’ is very familiar to us. It’s because the place La Paz is where you’ll find an authentic Batchoy. Bacolod City’s famous chicken dish Inasal (barbecued chicken) has spread far and wide across the globe. Unlike the usual barbecue or grilled chicken that uses soy sauce, this dish uses different ingredients for its marinade and basting sauce that create a unique flavour. Key to this unique flavour is the native coconut vinegar and Calamansi (local lime fruit). And these ingredients give the dish the distinct taste and smell that only authentic Bacolod chicken Inasal is famous for. In the culinary capital of Pampanga, sisig is a favorite pulutan or beer chow among Filipinos. The meat is primarily from the pigs’ face — in the Philippines, no cut of the animal goes to waste. Ears and head of the pig mixed with fried onions and chili. Its served with rice and calamansi. Many cities in the Philippines have their own take on cooking sisig but nothing beats the original, which is from Pampanga. The popular dish still has many variations with recipes varying from city to city, and sometimes, family to family, in the Kapampangan province. Sisig is the most popular dish in Angeles City. The popular restaurant, Mila’s Tokwa Baboy, is always full and maybe you need to book in advance. Pinakbet (also called pakbet or pinak bet) is an indigenous Filipino dish from the northern regions of the Philippines. The original Ilocano pinakbet uses bagoong of fermented monamon or other fish for seasoning sauce. But further south in the country, bagoong alamang is used to season the dish instead. A well known festival celebrating “pinakbet” features street dances and cooking competitions. A popular dish in Spain and its former colonies, Lechon. Cebu is the home of the best lechon makers and purveyors of the Philippines. In every grand occasion, the star and the center piece of Filipino buffets is lechon. The word “lechon” came from the Spanish term that refers to a roasted suckling pig. Lechon is a skewered whole pig roasted over charcoal, a popular dish in the Philippines. The lechon from Cebu is famous all around the world and is a common souvenir that people bring back after a trip to Cebu. It is also perfect for parties or other get-togethers, and goes well with the puso or hanging rice. Sinugba, or grilled, refers to the grilled pork in the dish cut into chunks. Kinilaw, or raw, refers to the raw fish or seafood in the dish. This is soaked in coconut vinegar with onions, ginger, salt, suwa (native lime) and tabon-tabon fruit extract (native chico fruit). Kinilaw is actually the main part of Sinuglaw, the grilled pieces of pork are just added at the end. It’s sour and salty, and also a little bit sweet, all tastes that are very distinct and delicious as a whole. So if you’re ever in the city of Cagayan de Oro, sinuglaw is one of the dishes you shouldn’t miss. It’s a very popular dish for tourists who love eating authentic local food. 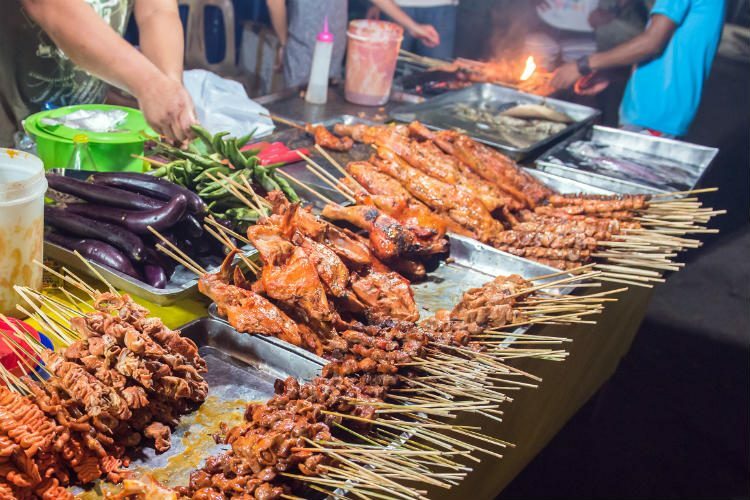 These are some of the must-try Filipino food when you visit the Philippines. We encourage you to share in the comments below what do you think is the best dish? And if you have experienced tasting these special dishes, share with us what your favorite dish is and why!